The Olivier Award Winning spectacular! Inspired by the motion picture 'Forbidden Planet' courtesy of Turner Entertainment Co. 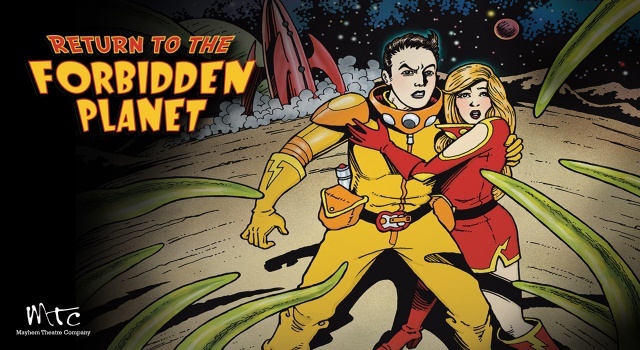 The Olivier Award-winning spectacular, Return to the Forbidden Planet, has set its course for Epsom Playhouse this Autumn! Join Captain Tempest and the crew of the Intergalactic Starship Albatross as they travel deep into hyperspace. What’s waiting for them? A mad scientist, a scary space monster, unrequited love and the mysterious planet D’illyria – a star not yet marked on their cosmic charts. With a riotous mix of Shakespeare, B movie Science Fiction and some of the biggest Rock ’n’ Roll hits from the 60s and 70s, this feel-good musical, that’s perfect for all the family to enjoy, is sure to have you rockin’ all night long! An amateur production presented by Mayhem Theatre Company.